Rare beer. It’s a term I’m starting to understand more and more even as I write this story from my house which is less than a mile from Anheuser Busch. One such beer is Oskar Blues Java Barrel Aged Ten Fidy. This beer is such a bear to make that very little is actually produced. To be even more clear, only 50 barrels were brewed and only one of them found it’s way to our area. 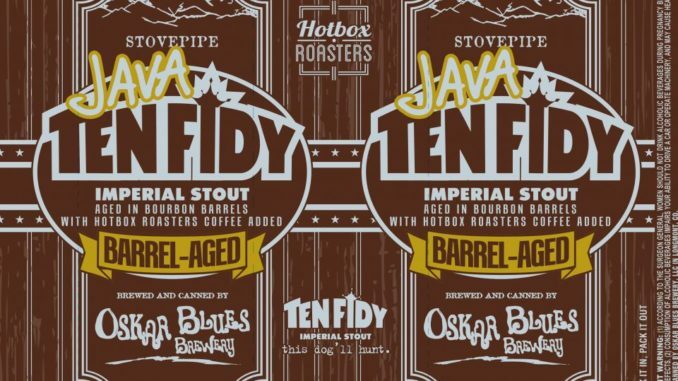 Java Ten Fidy is the base imperial stout aged in bourbon barrels, with Hotbox Roasters coffee. The same coffee found in Hotbox Porter. To create it Oskar Blues brews regular Fidy then filter the Fidy into fermentation vessels (FV’s) then fill bourbon barrels directly from the FV’s. The beer is then but into bourbon barrels where it is aged exactly 8 months. The brewers want the beer to be in the barrel through the winter and summer to swell into and out of the wood as much as possible. With Ten Fidy being so viscous, it takes longer than other beers they’ve aged in bourbon barrels. We make sure to try and get blends of all ages into each batch. This is a pain in the end it’s worth it. Next they empty 120 oak barrels into a (FV) that has been sanitized, CO2 purged and pressurized. Each barrel is 53 gal completely filled. They fill a 200 bbl FV with a blend of all barrels. Then they re-filter the aged beer to remove any char from the barrels, this cleans the beer up bigtime and makes it taste way better. Then they flash pasteurize the beer into a BBT, carbonate and package. The brewers say pasteurization is probably unnecessary 99.9% of the time but a micro problem can occur (think Goose’s Bourbon County Stout recall 2 years ago) so they do it. I’m tired just from typing all that. So, as I said only 50 barrels of the Java Ten Fidy were produced, and only one is in our area. It’s home is now at the Global Brew Tap House in O’Fallon, Il (455 Regency Park, O’Fallon, Illinois 62269). The only other barrel went to a beer bar in Rockford, Illinois where it promptly sold out in 28 minutes at a 9am tapping. 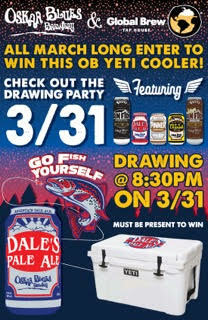 Global Brew is wrapping up their month of Oskar Blues with a Go Fish Yourself Party! Among the special releases will be the Barrel Aged Ten Fidy and Barrel Aged Java Ten Fidy. Go and get yourself at taste.